The technology uses a continuous-flow activated sludge process with biological nitrogen and phosphorus removal, which combines the following processes in a single tank: mechanical pre-treatment, excess sludge collection, biological treatment using a low-loaded activated sludge process, separation of the treated water from activated sludge in the final clarification chamber, flow balancing of fluctuating inflow of wastewater in the retention chamber. The treatment process consists of several technological processes. Raw wastewater flows into the non-aerated activated sludge chamber with anaerobic and anoxic zones creating and admixture with the recirculated activated sludge, the mechanical pre-treatment of inflowing raw wastewater and the decomposition of coarse impurities, denitrification and accumulation of readily degradable organic contamination is taking place in the non-aerated activated sludge chamber, which is divided by inner partition walls to create a vertical flow labyrinth, where internal circulation is established. Furthermore, allowing the admixture flow gravitationally into the aerated activated sludge chamber with includes fine-bubble diffusors. In oxic conditions the biological degradation of organic contamination, nitrification and phosphorus uptake is taking place. The activated sludge flows into the final clarification chamber, where the activated sludge is separated from the treated wastewater. The treated wastewater is discharged into a water flow, infiltrated or recycled and the separated activated sludge is recirculated by air-lifts. A flow regulator is installed at the water level in the final clarification chamber which controls the outflow in order to maintain the water level between the normal and maximum level in the tank (integrated retention chamber). The pressurized air is supplied by blowers for aeration of the activated sludge chamber and for recirculation via air-lift pumps. 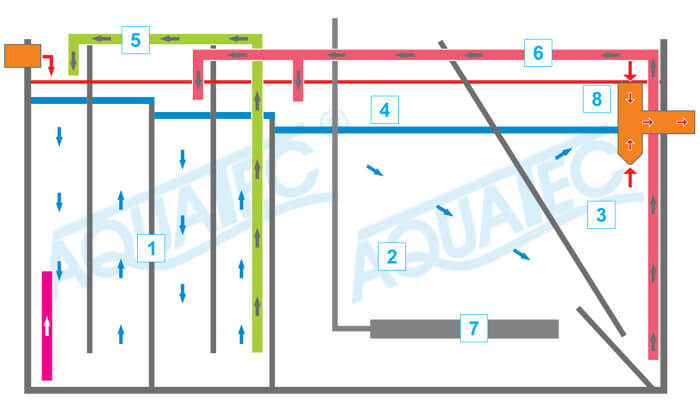 The recirculation and aeration is controlled by a microprocessor control unit which also enables the wastewater treatment plant to work in various modes depending on the loading. The technology Vertical Flow Labyrinth – VFL®, used in the biological reactor, is protected internationally by patent. The purification technology ensures the high quality of purified water, low investment and operation costs. The AT wastewater treatment plant meet the requirements for the resistance of inflowing sewage water abruptly. Ensuring the homogeneous operation of the wastewater treatment plant in the event of abrupt outpour of high volume of water (e.g. bathtub, washing machine, etc.). The wastewater treatment plant main problem is respect to the discharge of the activated sludge upon every abrupt inflow resulting in solving this issue. The quality of purified water corresponds with the Directive No. 269/2010 requirements in the Collections of Laws according to the Government of the Slovak republic for discharging the water into the ground or on the surface.